There’s nothing like London Fashion Week because British fashion designers are like no other – creative, evocative, fearless. Once again the ani M INTERIORS team is bowled over by the vibrant prints, bold colours, sharp tailoring and playfulness on show. Stand-out hero was Jean-Pierre Braganza and his ‘Whiplashed’ Spring/Summer 2016 collection. Its angular prints in primary colours had a fluid quality, as though Mondrian paintings had been folded into origami birds and come to life on the catwalk. Feeling thoroughly inspired, the team has turned its attention to how this will influence interior design trends in the year ahead. Key elements are a monochrome palate with splashes of vibrant red, yellow or blue. While the combination of bold geometry transforming into organic shapes is alluring. Finding pattern and form then softening the lines, playing with perspective and creating something wonderfully tactile is an art that Decorex and 100% Design have perfected. 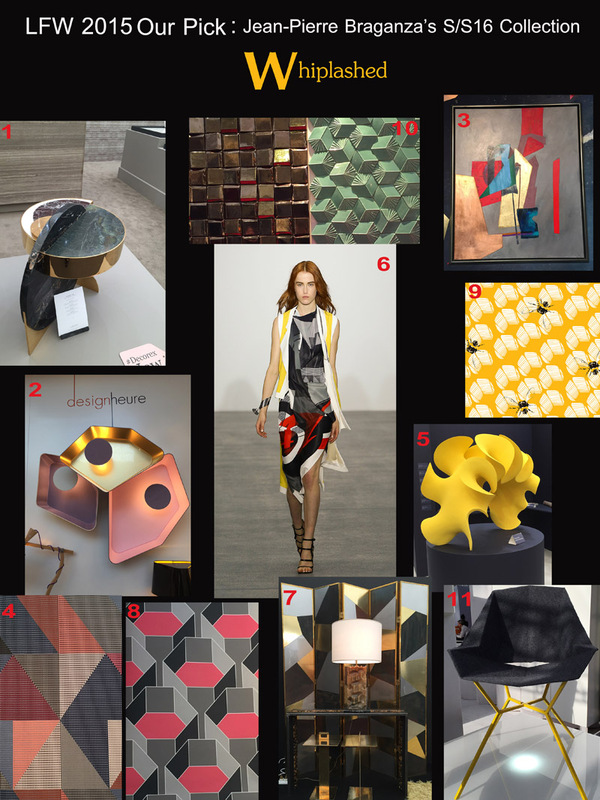 Here’s the ani M INTERIORS mood board for bringing Braganza’s organic symmetry from the catwalk to your home. 1. Decorex: The Lunar Collection: Full Moon Side table by Lapicida. 2. 100% Design: Wall lamp TRIO LED Petit Nénuphar by Design Heure. 3. Decorex: Braffis in a deluxe handmade frame by Quintessa. 4. Decorex: Fabric by Margo Selby. 6. LFW SS16: ‘Whiplashed’ by Jean-Pierre Braganza. 8. 100% Design: HexaGone 3 Pink/Grey Wallpaper by quirk & rescue.